Beautiful day for a picnic! 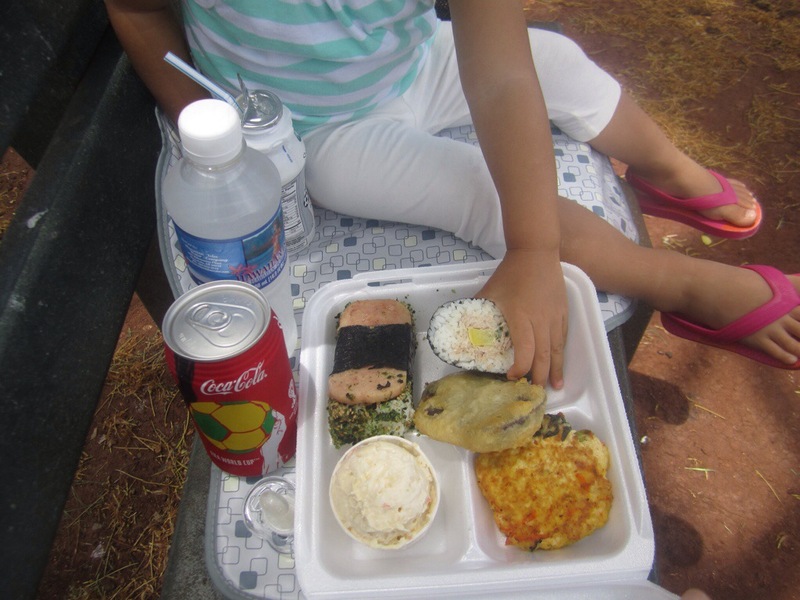 Today’s lunch from Gulick Delicatessen: furikake spam musubi, tuna roll, sweet potato tempura, tofu patty, potato mac salad. 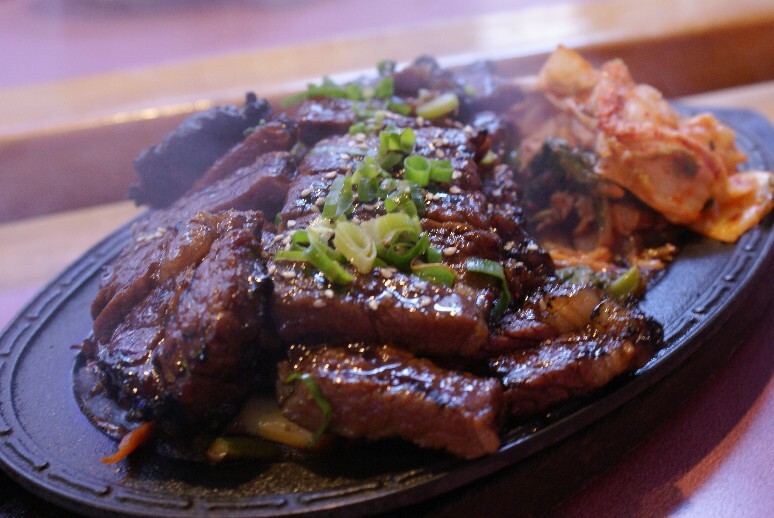 We were finally able to make use of our gift certificate to celebrate a belated anniversary. 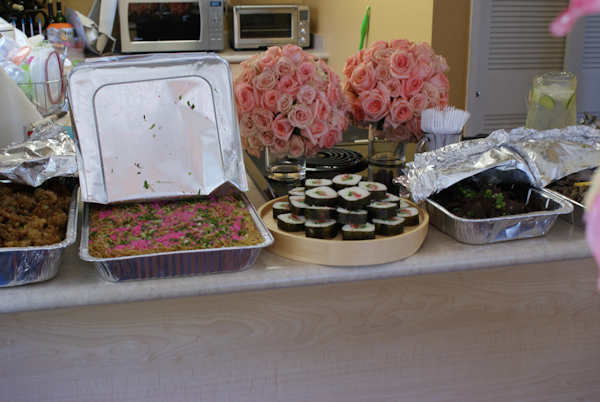 We said good bye to Nomz as we left her at her cousin’s and headed off to our reservation at Alan Wong’s. Neither D or I drink much alcohol. 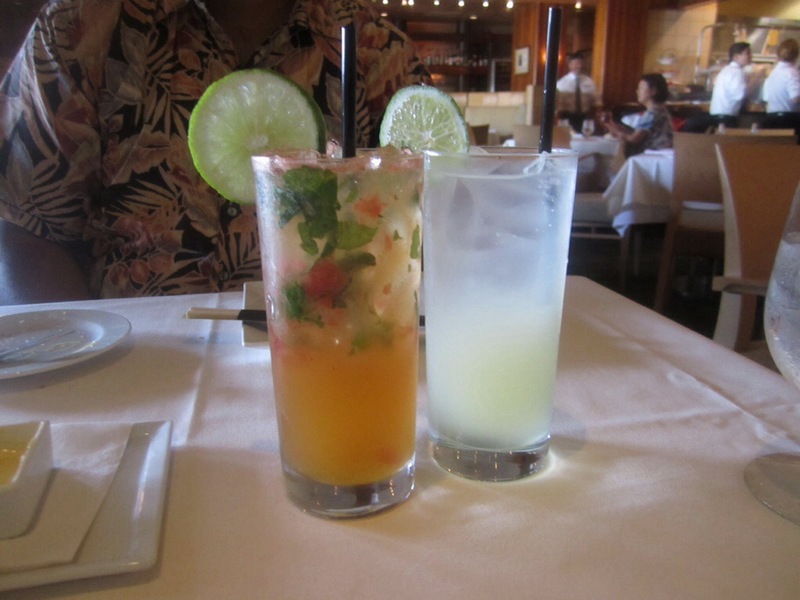 Our virgin passion fruit mojito and yuzu soda. So refreshing! 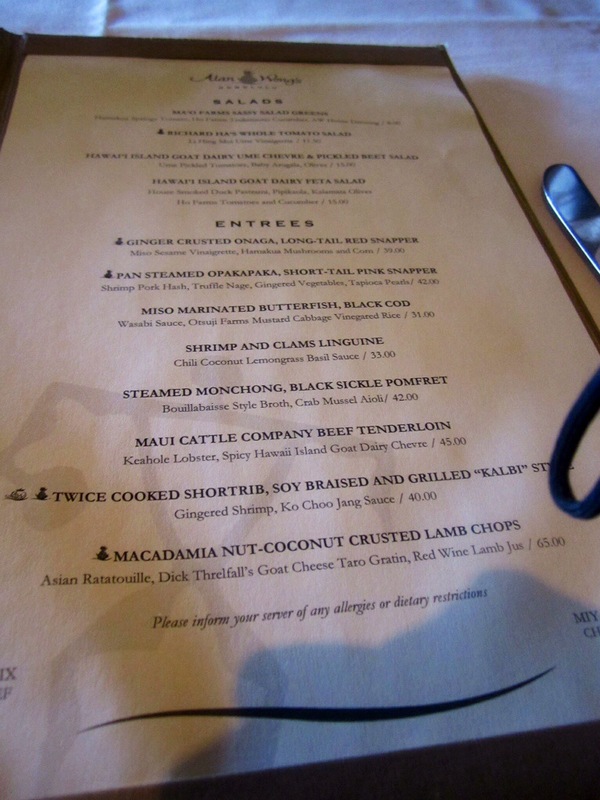 After studying the menu, the Chef’s Tasting Menu seemed very attractive, but we decided to go ala carte and share everything. 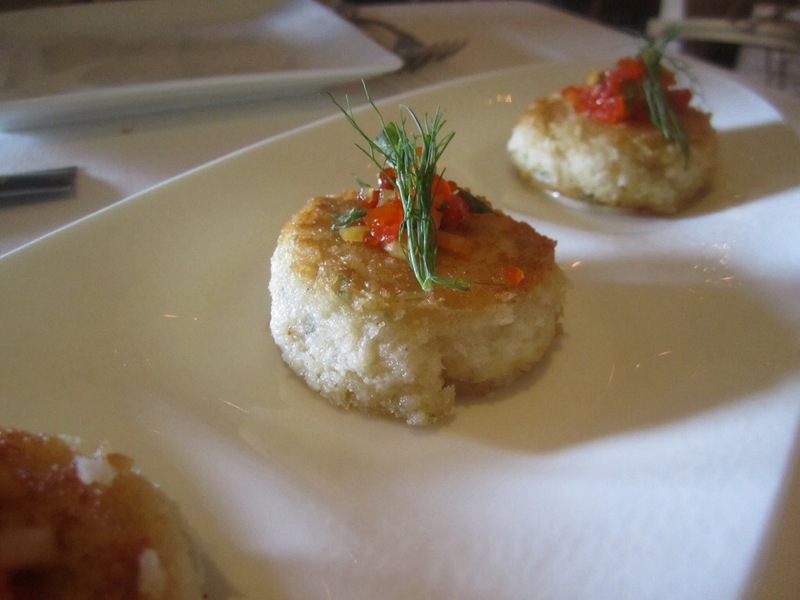 First came the Seafood Cakes with tsukemono relish ($20.00). The delicious cakes are made of lobster, shrimp and crab and topped with chopped tsukemono which I loved. 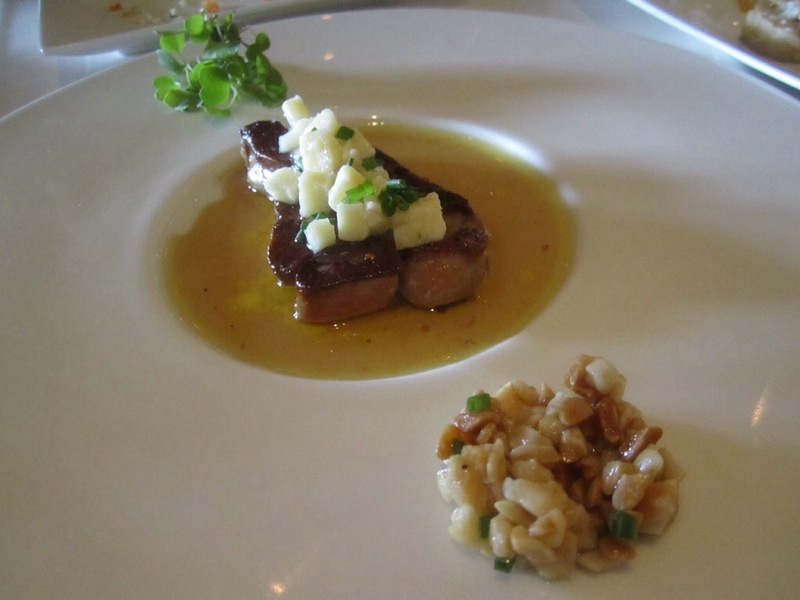 Hudson Valley Foie Gras with Vermont cheddar, maple syrup and macadamia nuts ($20.50) – such a rich decadent dish. 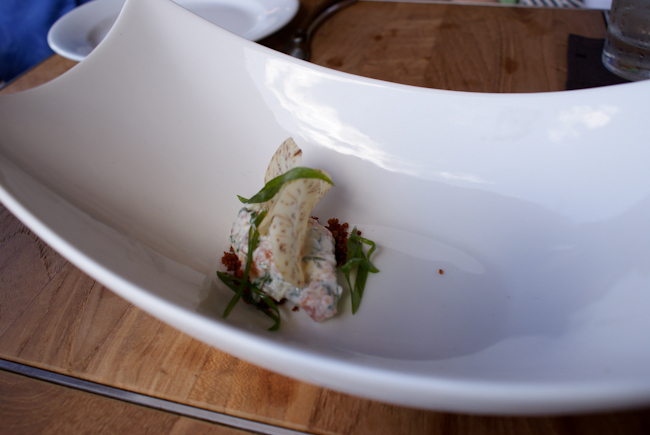 Hawaii Island Goat Dairy Chèvre and Pickled Beet Salad ($15.00). 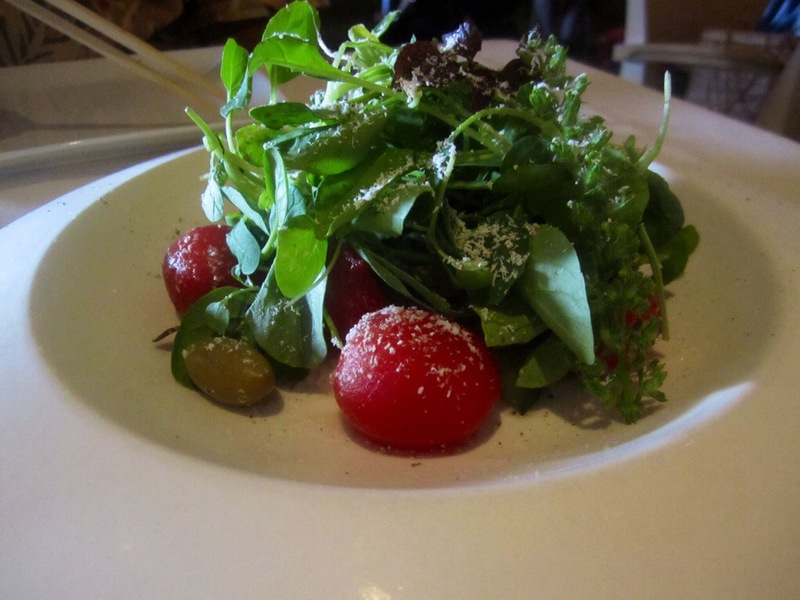 The tomatoes were lightly marinated in sweet ume and matched perfectly with the creamy goat cheese hiding under the greens. 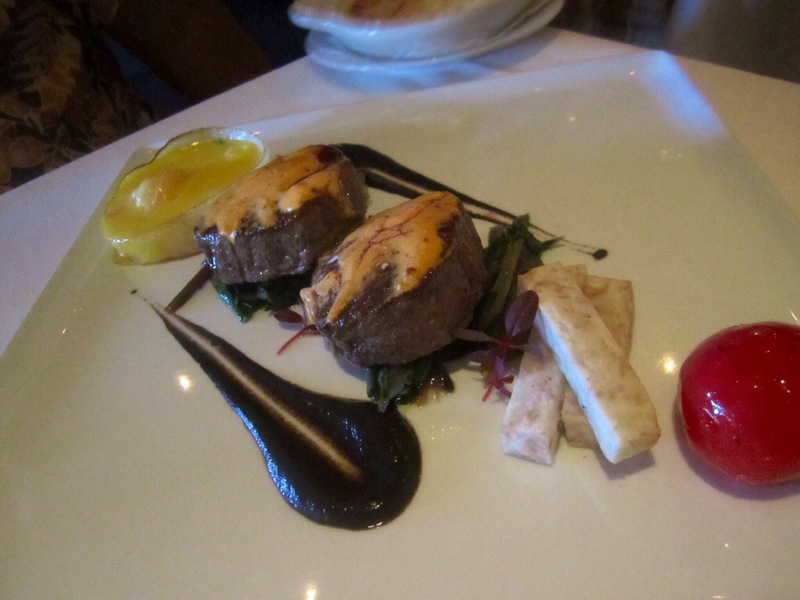 D’s entree was Beef Tenderloin ($45.00) served with spicy chèvre on top, bearnaise sauce on the side, and mushroom purée. My Pan Steamed Opakapaka ($42.00) with shrimp pork hash, gingered veggies, green onions and cilantro, and truffle nage all around. So much going on in this dish! 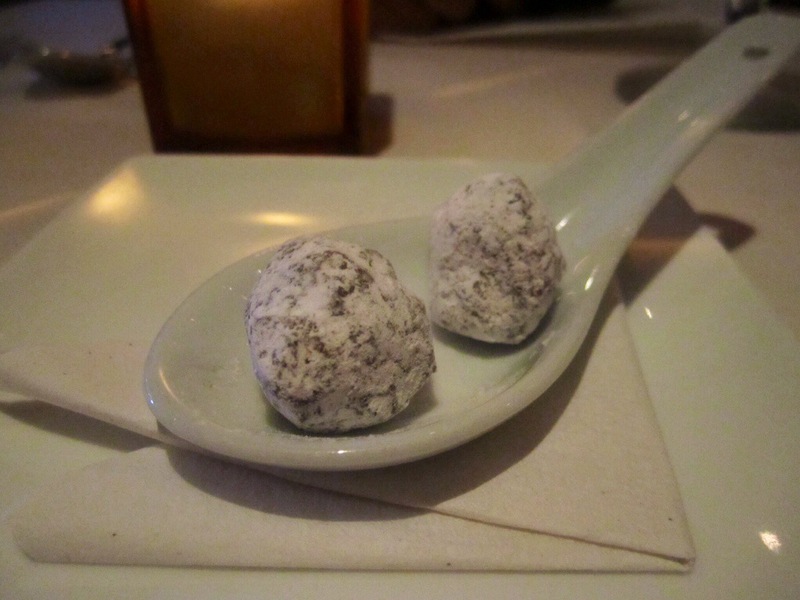 We skipped dessert since I had already put in a request for a stop at Bubbies afterwards, but macadamia nut chocolates were served as mignardise. Everything was so elegantly done and delicious it’s no wonder after so long in business they’re still booked full every night. 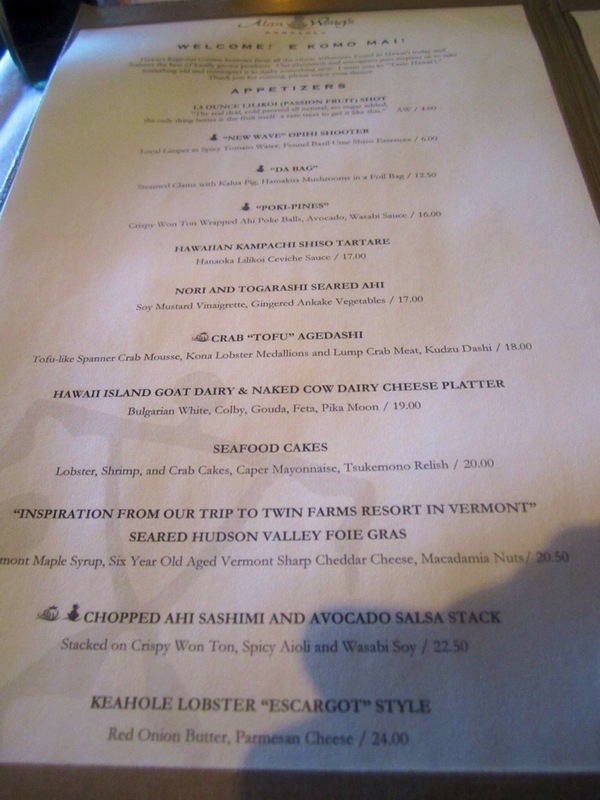 I most of all enjoyed slowly savoring a multi course meal in a fine dining restaurant, a rare opportunity these days. I can’t believe we are celebrating 10 years of marriage! What a wonderful 10 years it’s been, especially the last year with the addition of our daughter. If I had to choose one word to sum up how I feel, it would probably be “gratitude”. 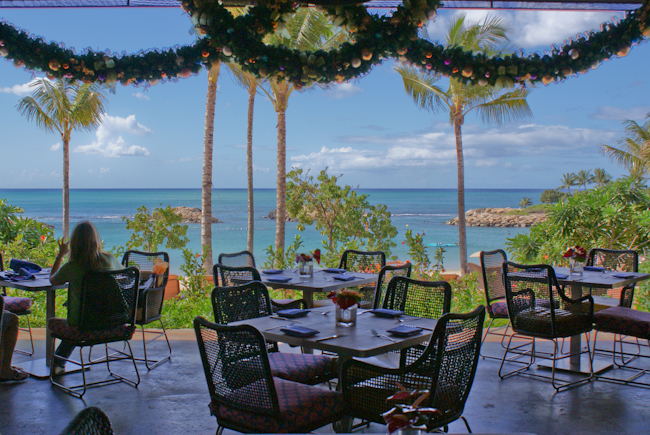 On a recent outing to Ko Olina, we enjoyed lunch and a stroll through the impressive grounds of Disney’s newly built Aulani Resort. 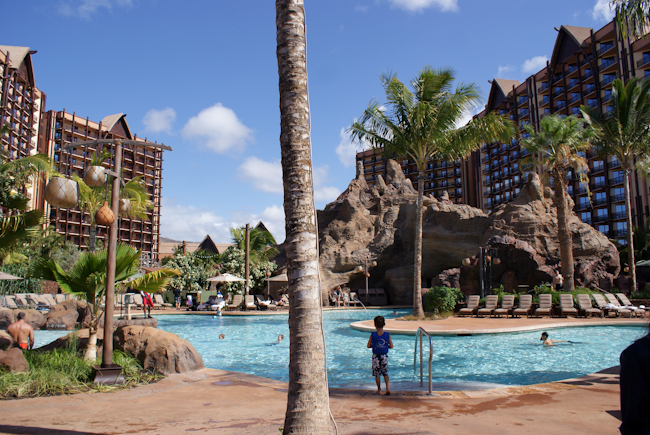 It’s no theme park, but with a waterpark-like pool area, cheery cast members and the occasional Mickey Mouse sighting, you can still feel a bit of Disney magic in the air. 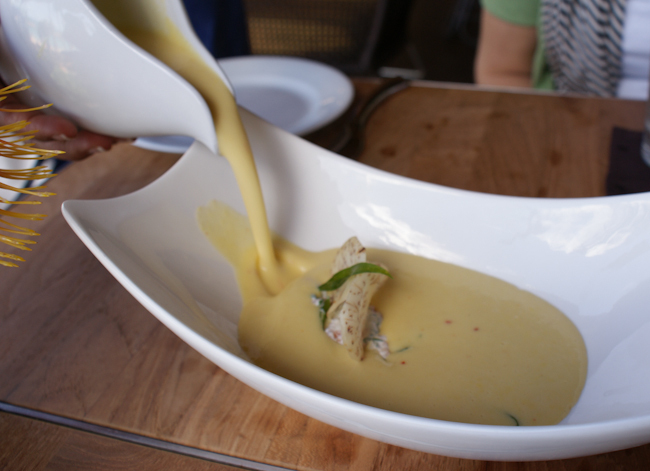 For lunch we enjoyed a fun presentation of Kahuku Corn Chowder ($9.00): the potage is poured into a bowl over bacon powder, lomi salmon, and taro chips, to be stirred together. 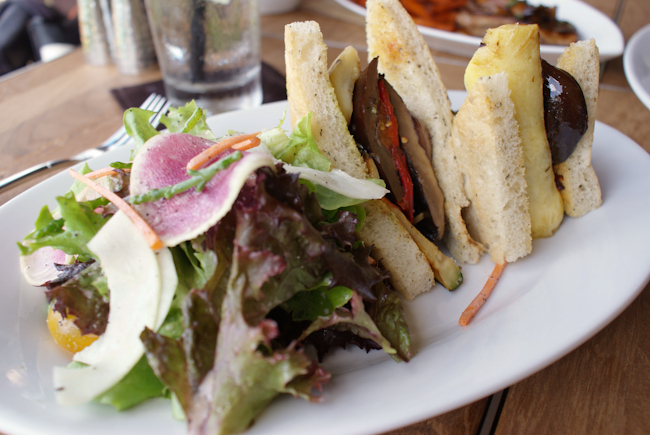 Chargrilled Vegetable Sandwich ($12.00): portabello mushrooms, eggplant, zucchini on focaccia with basil aioli. 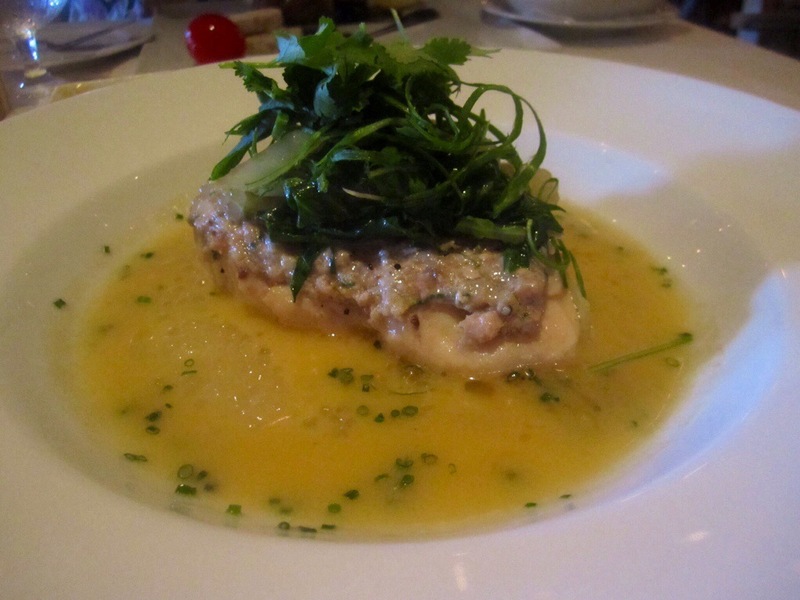 Served with field greens. 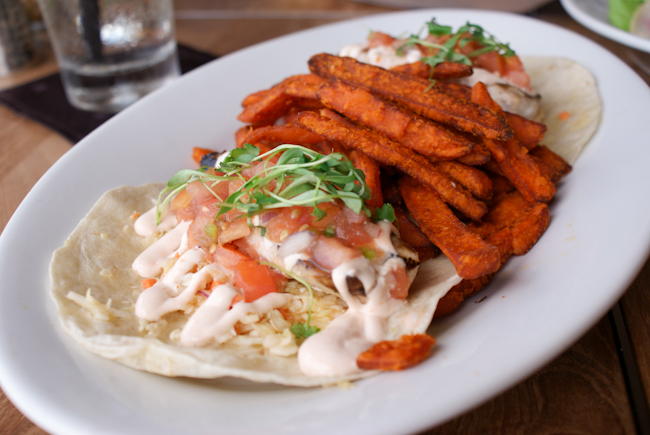 Today’s Hawaiian Sustainable Catch (Fish) Tacos, $19.00, with slaw and salsa, served with sweet potato fries. This was refreshing and light, with fresh cilantro. The sweet potato fries were addictive. 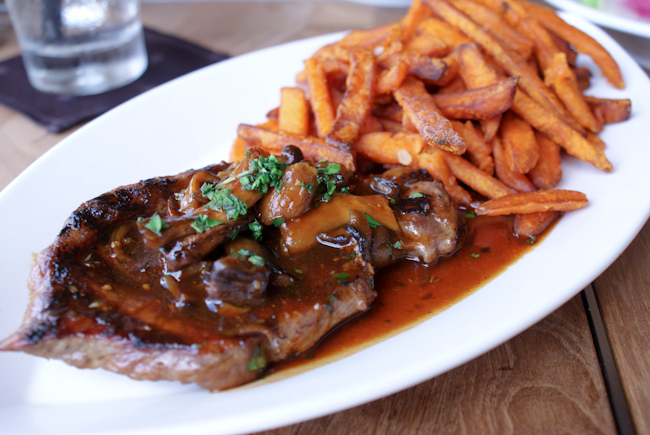 Grilled Sirloin Steak ($24.00) with sauteed mushrooms and sweet potato fries. 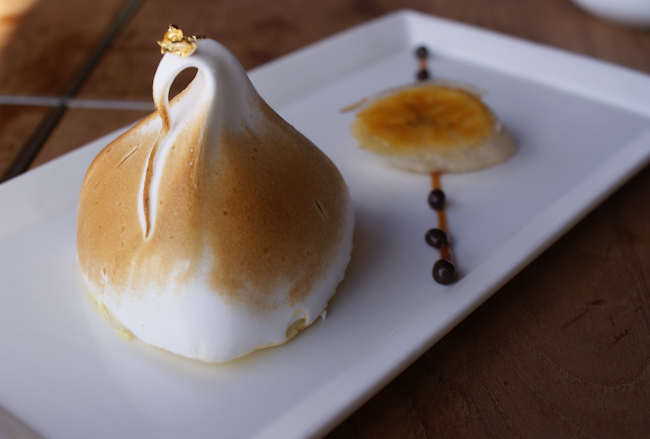 Lilikoi Meringe Mousse with Caramelized Bananas ($10.00): this was delicious and just the right size! Spacious Ko Olina Resort is a nice escape from the usual where you can experience a neighbor island feel without having to hop on a plane. 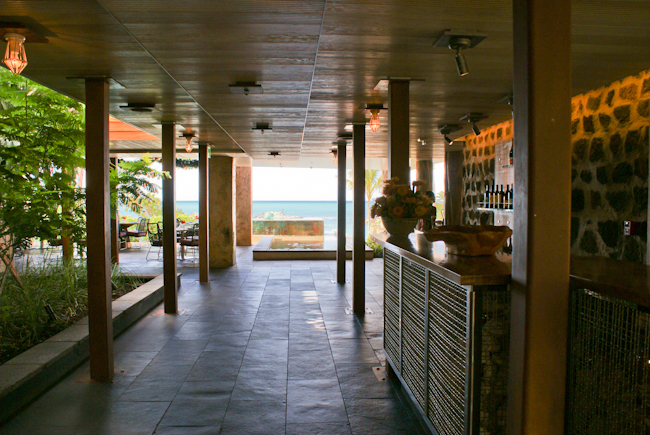 Whether you go for lunch or for the weekend, you’re sure to go home feeling refreshed and relaxed. We celebrated my niece’s 1st birthday with an intimate family party at SIL2’s. 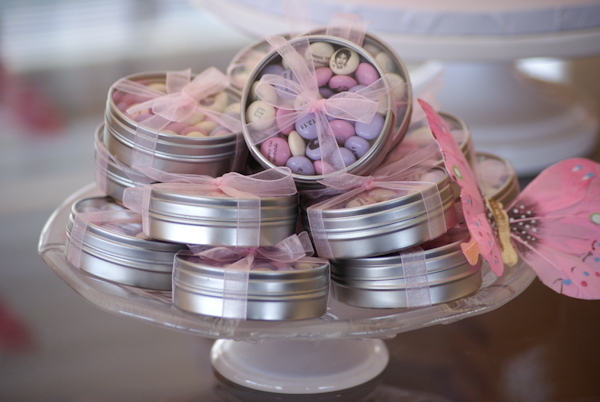 Cherry blossoms and pink butterflies adorned the house, and the birthday girl looked so adorable in a pink cherry blossom outfit and butterflies in her hair. 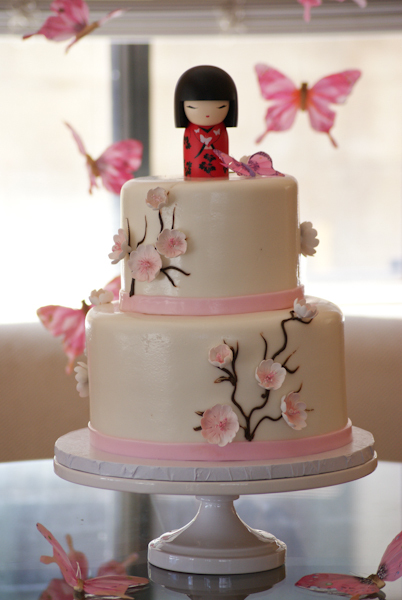 SIL2 ordered a fabulous custom cake from Cake Works, and hand-strung and hung butterflies from the ceiling. 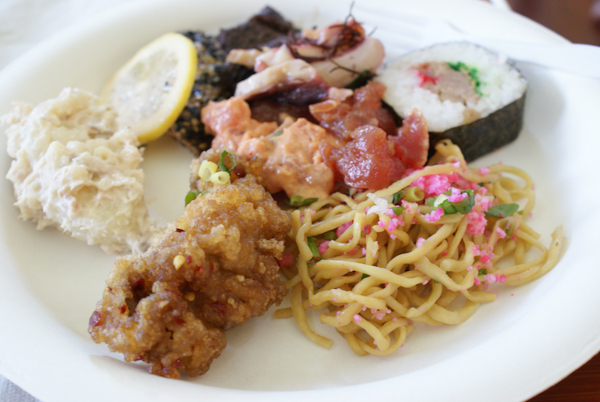 Lunch was like a sampling menu of local favorites: fried noodles from Jurison’s Inn, maki sushi from Kabuki, fried chicken, furikake ahi, and bbq beef from Aiea Bowl, 3 different kinds of poke from Foodland, and potato mac salad handmade by Grandma (MIL). The room was filled with lots of love for the sweet girl, and we wish her every blessing in life as she continues to grow…! Hubby’s brother (BIL4) and his wife (SIL4) are in town for a short visit from L.A. 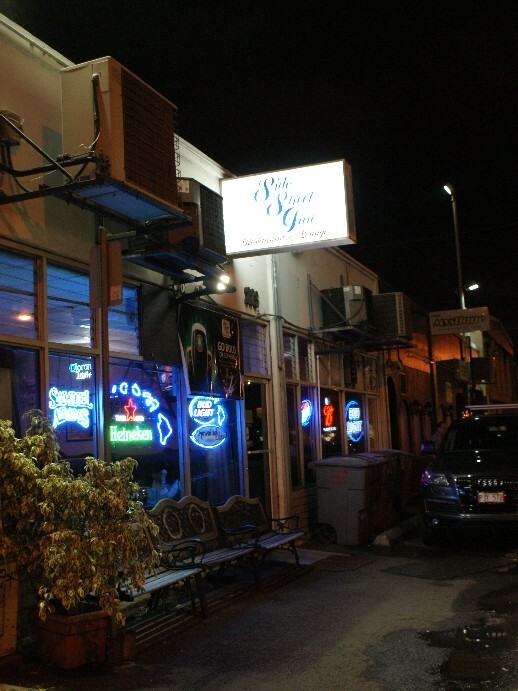 The family met up for dinner at the original Side Street Inn for some casual, local style eats. Side Street Inn is very popular for local style pupus and comfort food and I know a lot of chefs and cooks who like to hang out there after they get off work late at night. 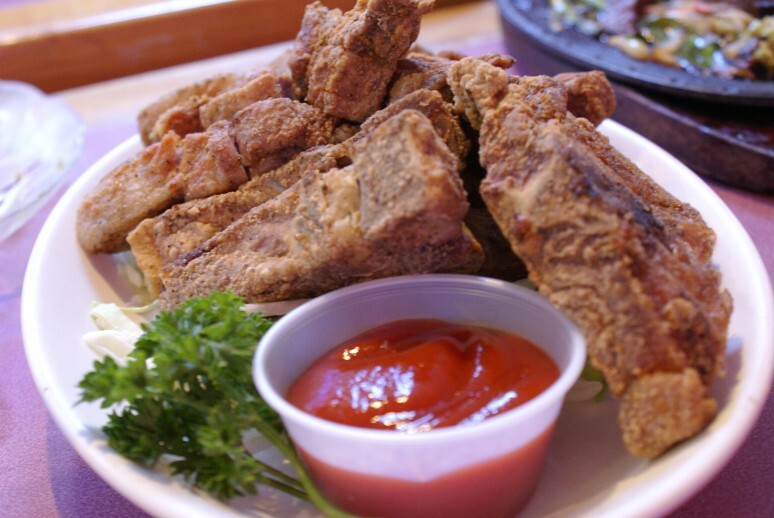 The menu here is unapologetically filled with deep-fried, buttery, carnivorous goodness. 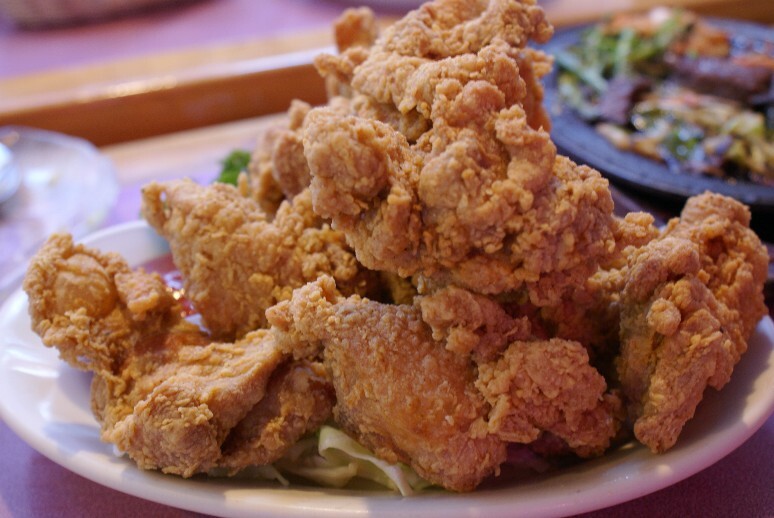 But that is what local comfort food is all about, and although I try to eat healthy most of the time, I can definitely appreciate a great, soul-satisfying meal at Side Street Inn once in a while. 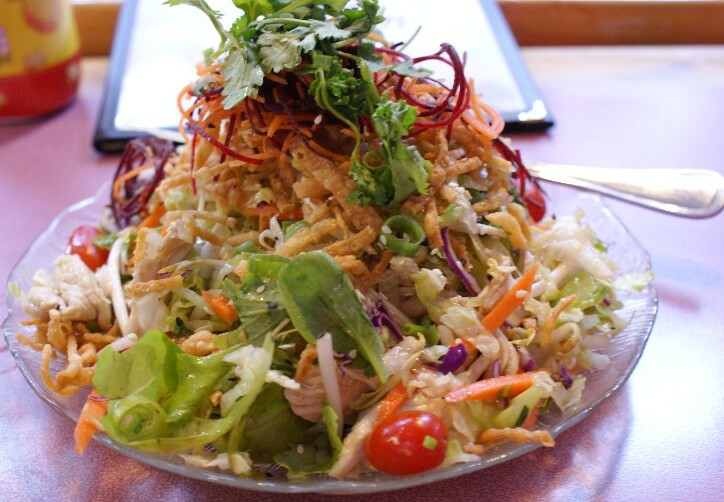 Chinese Chicken Salad ($7.50, half order) – my attempt at including at least some type of plant source in every meal. 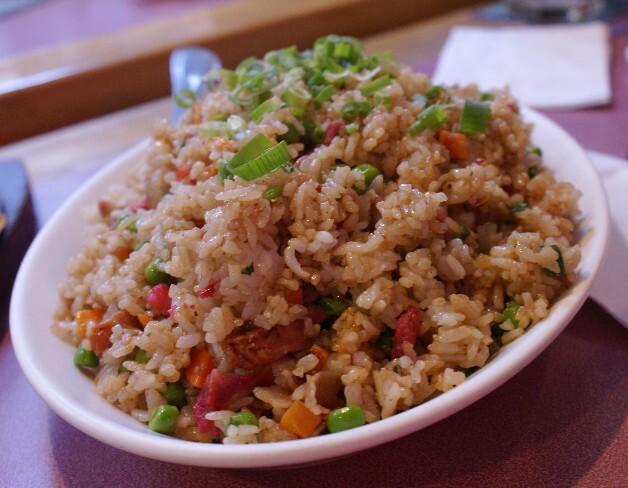 Original Fried Rice ($11.00) – with bacon, portuguese sausage and peas. Enough to feed 4 people at least! This place is so famous and popular and it’s no mystery why. 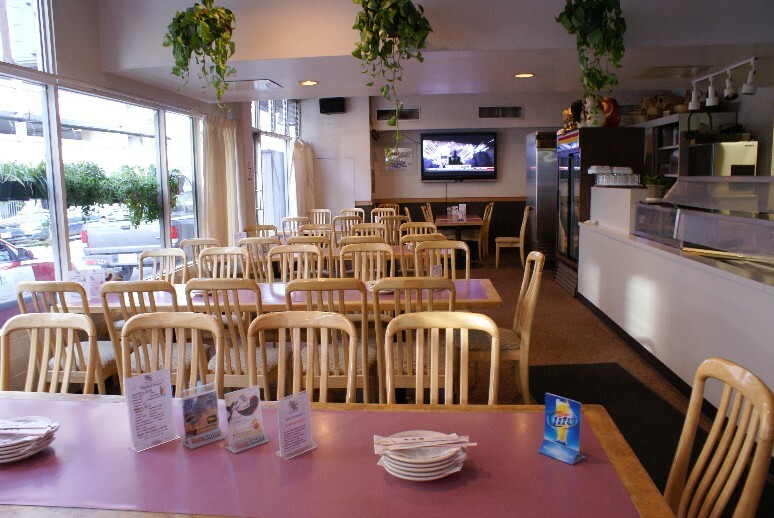 Great food, friendly service, generous portions, reasonable prices are the cornerstones of a successful restaurant in Hawaii. Side Street Inn’s got it down. I would recommend going in a large group and sharing everything pupu style. 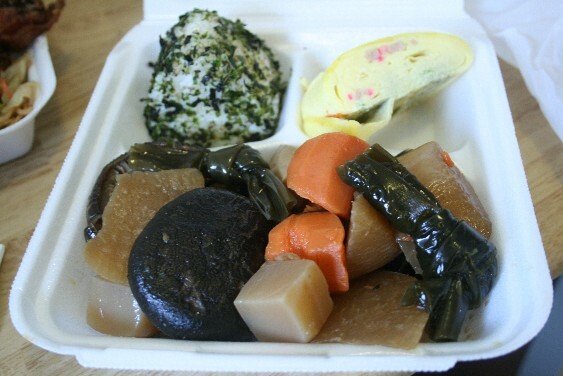 Today’s lunch was take-out from Gulick Delicatessen. I haven’t been to the original location in Kalihi but this one on S. King Street is close by and convenient. Known as an “okazuya”, this type of eatery has a spread of classic local and Japanese dishes like musubis, fried chicken, shoyu hot dog, mac salad, tempura, cone sushi and teri beef, all on display and priced per piece or single serving.The prices are cheap, the portions are big and I just love the freedom of picking out as much or as little as I want for a customized plate lunch. Hubby’s plate was so heaping big the lid wouldn’t close and only cost $6.40 total! 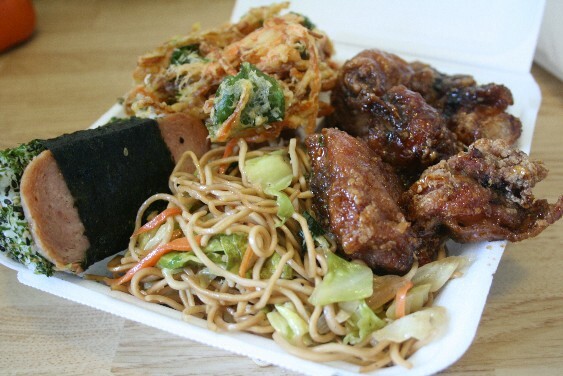 Spam Furikake Musubi ($1.35), Chow Mein ($1.35), Spicy Garlic Chicken ($2.85) and Veggie Tempura ($0.85). My plate of Furikake Musubi ($0.95), Omelette with Spam and Kamaboko ($1.95) and Nishime ($2.55) for a total of $5.45. It’s been a busy week for me, playing tour guide to my mom and auntie. 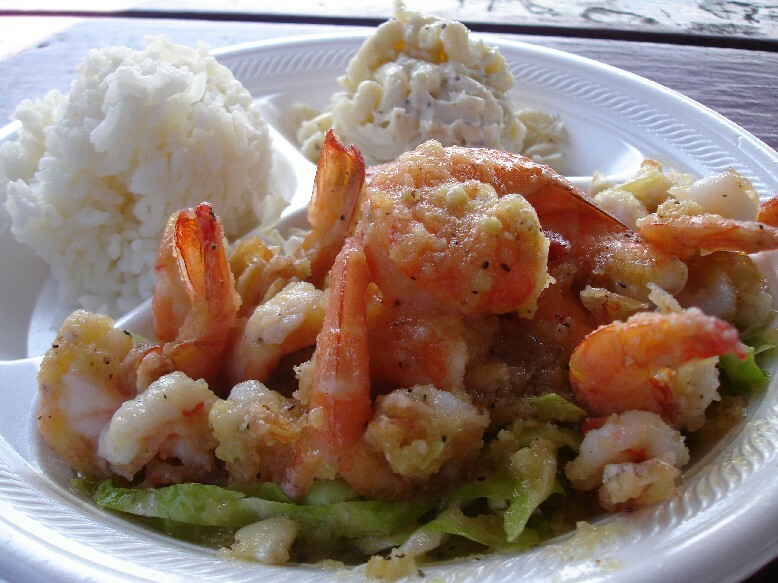 I forgot to take photos of most of our meals as we ate our way around the island but one meal I did manage to take was our garlic shrimp plate in Kahuku. 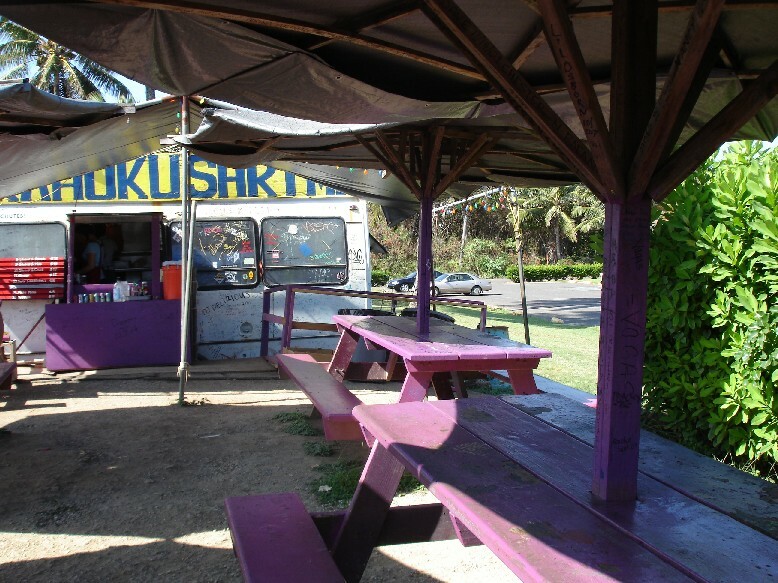 Kahuku shrimp has now become a must-stop spot for visitors with so many shrimp trucks to choose from. My sister swears by Sachi’s (I think that was the name – I don’t remember any large signage), between Giovanni’s and Fumi’s, right across the street from Kahuku High School. 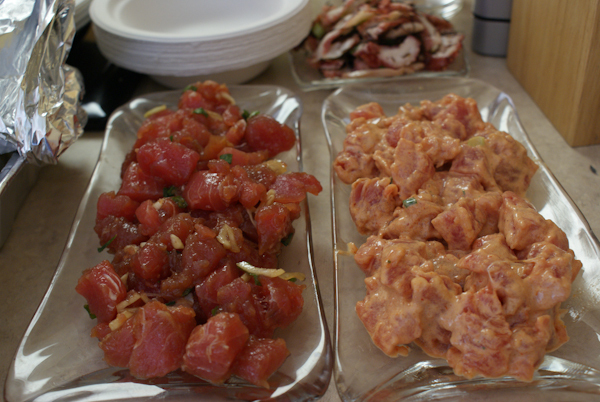 I’ve tried others and like Sachi’s so far, but am also interested in trying out others. There are many flavors to choose from, but it’s always the Garlic Butter Shrimp Plate ($11.00) for me. This is no time to be modest: this plate requires digging in with your hands, sucking the garlicky goodness from the shells, then licking the dripping butter from your fingers. Yum! 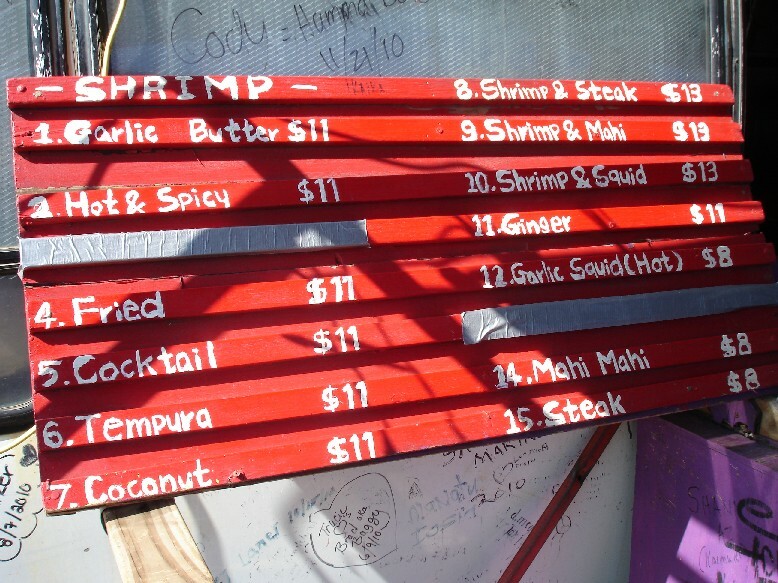 A circle-isle drive is just not complete without a stop at one of Kahuku’s famous shrimp trucks.